W2 Harmonizer, Other Virtual Intrument from 7Aliens. 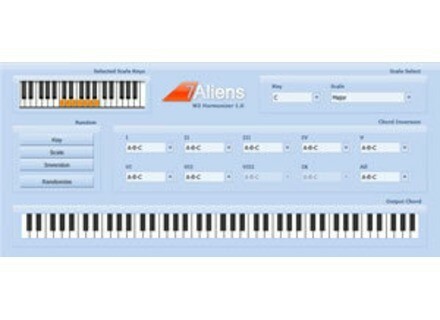 7Aliens has announced W2 Harmonizer, a new scale-based VST Instrument Plug-in MIDI Harmonizer and Scale Viewer that converts single incoming MIDI notes into full chords based on selected scale. The full version contains 91 scales which, with 12 semitones, makes 1092 scales in total. Overcome lack of inspiration / Break composer's block. W2 Harmonizer is "coming soon" and will be available for Windows as a VST instrument plug-in for the introductory price of €35 (the full price will be €45). reKon Audio VST-AU JUNO-106 Editor The VST-AU JUNO-106 Editor is a real-time MIDI synth editor designed to allow you full control of every parameter of the sound on the Roland Juno-106 synthesizer, according to reKon. AudioTeknikk GreenEugene AudioTeknikk has released beta version 0.4 of GreenEugene, a free saturation filter and distortion VST effect plug-in for Windows.